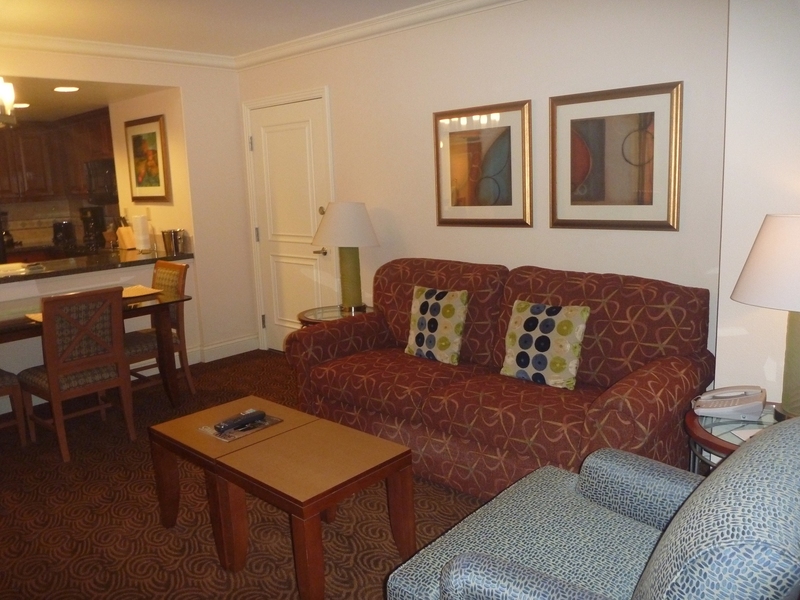 We were invited to see the Hilton Grand Vacation Club Timeshares Resort in Las Vegas, at $100.00 per night, we were promised a great room. All we had to do is give 1 hour of our vacation time in Las Vegas to Hilton Grand Vacation Club and listen to their sales pitch. We thought why not, it might be a really great room with strong possibilities for less expensive vacations in the future. We chose the location, mistake one, on Las Vegas Boulevard next to the old Circus, Circus Casino. Although, we did stay on Las Vegas Blvd., aka. “The Strip,” it was the old part of “The Strip.” The Hilton Hotel/timeshare we stayed at was so removed from the modern part of the Las Vegas Strip; we might as well have been on the moon. If the suite we stayed in was located in the modern, updated, portion of “the Strip” it would have been worth the $100.00 per night Hilton charged, located on the moon not so much. This was the one time of the year that my husband and I put aside for a Las Vegas, Nevada vacation. The one hour we were told that we would have to give up of vacation turned into the never-ending tag team event. It, the “tour,” took four hours, of which we sat in the same chairs for 3 3/4 hours. I started singing the theme song to myself from Gilligan’s Island, “A three hour tour, a three hour tour.” I must say, I am not a fan of the three hour tour, so FOUR hours was over the top of the top. We were greeted by salesman number one, Mr. Happy, a very likeable fellow, who became very friendly, very fast. Fortunately, we spent most of our time with salesman number one. We began hearing stories about his family and their vacations; they sounded nice enough, but really YAWN. I guessed I could listen to this guy for an hour for a good room, but not in this location. We were told about all of the benefits to Hilton Grand Vacation Club Timeshare Resorts. There seemed like many benefits with innumerable possibilities for amazing vacations, until we realize that we can do those same vacations for less money per year, but still there are some benefits. Then the other shoe hits the floor, there are some major flaws the timeshare owners incur, those being maintenance fees and property taxes that can and most likely will go up each year. Did I mention the deal of the day? Apparently, some unfortunate people cannot afford to keep the Hilton Grand Vacation Club timeshares they have purchased and sell them back to Hilton, who in turn resells them to us at a low, low, price. We were told that we could purchase a timeshare from Hilton Grand Vacation Club located in California in Las Vegas, Nevada, at an extremely low price. The original price was going to be a little over $42,000., for two weeks per year of vacation in the Hilton Grand Vacation Club timeshare resorts, but friendly salesman number one, Mr. Happy, said “Hang on there, I think I can get you a better deal.” Enter salesman number 2, aka. Mister Serious Guy. Mister Serious never smiles. He actually told us he was extremely busy, didn’t really have time to talk to us, and therefore could not spend much time with us. Salesman number 2 never even greeted us with a smile; apparently he has no time for polite behavior. Mr. Serious gave us the new low, low price of approximately $31,000.00 for two weeks vacation per year. We passed. Next, the price came down to about $22,000. for one week of vacation time per year for the rest of your life, plus maintenance fees and property taxes for the rest of your life, and your childrens’. (Note that as the price comes down, so do the benefits) We again passed, figuring that again we can still afford to vacation for less than that plus the interest on the loan that we would have to take to purchase the vacation. All the while, we were pretty much being talked to about the “great deal we were passing up, and how if we left without purchasing something from Hilton Grand Vacation Club Timeshare Resort that day, we would NEVER be offered a good deal from Hilton again.” I am now singing louder than ever in my head, “A three hour tour.” Our thoughts on this kind of sale are that it wasn’t a good deal to begin with, if it can NEVER be offered again. The NEVER AGAIN tactic involved in the sale of Hilton timeshares, is nothing but high pressure tactics employed by people who haven’t got any confidence in their product. Plus, interestingly, the special deal we were being offered was a timeshare in California, where property taxes are known to be high, so the only question I had wasn’t being answered, why is a Las Vegas, Nevada, salesman trying to sell me California property? “A three hour tour!” By this time salesman number one, Mr. Happy was really getting impatient with our ignorance to the “great deal” he was offering us. “You have to be crazy to turn this down, Hilton won’t be offering this deal to you EVER again.” “But wait, because I’ll get the guy who is going to sign you out that you did attend our meeting.” My thoughts, why because you Mr. Happy cannot give us a piece of paper to sign saying we attended? Now, let’s talk about the room. The room was very similar to Embassy Suites, a hotel in which we stay frequently. Embassy Suites is also owned by Hilton. We do enjoy Embassy Suites, but we thought that the “great room” that the timeshare would offer would be a better step up, or better set up. Maybe it was and I am being negative. Rooms are really suites, consisting of: kitchen, dining room, bedroom, and connecting bathroom. The living room of the suite was decorated in 5 colorful and busy patterns. In all honesty, it looks like an amateur decorated it, or Hilton got a sale on all the stuff that wouldn’t sell to anyone else’s hotel. There were too many patterns to make the room feel relaxing. Although, this vacation, I did not bring my children, I think they would have been bouncing off the walls overly excited and overly stimulation from the environment, and not in a happy way. I felt like my skin was crawling. 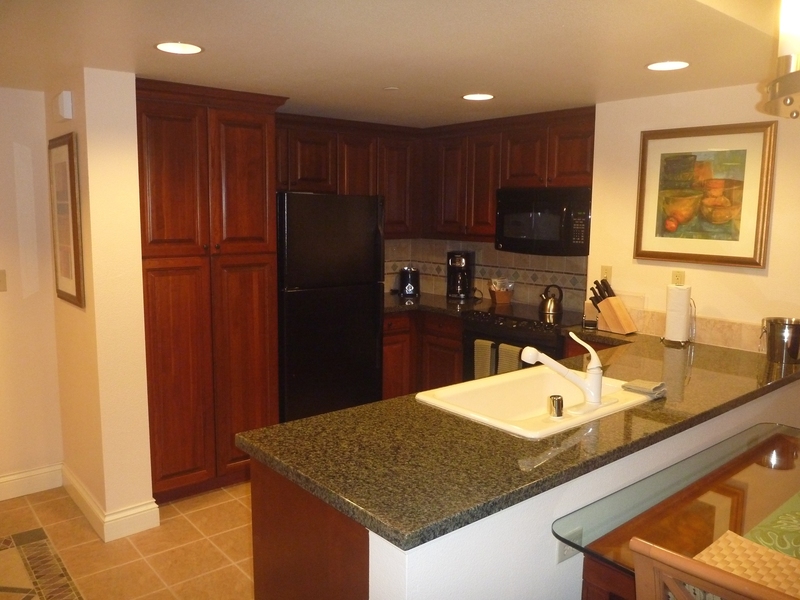 The suite offers a huge kitchen, with an apartment sized washer/ dryer, full size refrigerator, stove, oven, microwave, and dishwasher. Okay, nice. Except the kitchen was way too big for a “vacation” kitchen, leading the guest into thinking that mom would be working herself into a frenzy of cooking, cleaning , and doing laundry. Hmm, where is the vacation factor in this picture? I guess it would be nice to have these amenities, but it looks like a working vacation for mom. Basically, same life, same work, different location. The suite doesn’t resemble vacation for mom. In fact, the tub is a soaking tub, not a whirlpool. Further, before you enter the suite take note of the doorbell on the outside of each room. The maid doesn’t knock, she rings the bell, “time to get up,” and that is if you are lucky enough to have maid service. (The doorbell is useful to mischief makers as well. Looks and sounds like great fun until your family is on the receiving end of the doorbell early in the morning. ) Before we left the suite for our “tour”, a maid came by anxious to clean the room and rang the door bell even though the “Do Not Disturb” sign was up. The bell was loud enough to wake us up in the bedroom. Upon returning to the suite after the “tour”, we noticed that the towels had not been replaced with clean towels, the bed had not been made, no new shampoo, a few dishes in the sink, etc. We had been out of the room for four hours. I called housekeeping to let them know that somehow we had been over looked, and that we would be out again to give them a second chance to clean up (it was already after 4:00 pm). The person on the phone let me know that many rooms were not cleaned every day, and that many were not included to be cleaned even once a week. Hmm, does that mean mom, or dad, WILL BE cleaning the suite during hard earned vacation time. No matter who cleans, every member of the family will be waiting while the housework gets done. I’d like to believe that the person on the other end of Hilton housekeeping’s phone was misinformed. I do know however that business must be bad in this location. The suite was a dusty mess. I realized it in the middle of the night when I got up to use the bathroom. I walked bare foot across the tile in the bathroom, and cringed at how dusty my feet got. In the morning, I put on a pair of black socks, and they were soon gray from the dust on the tile floor in the kitchen. I am pretty sure that the suite we stayed in had not been cleaned for months because of the dusty floors. Makes you wonder then why we were given a 1 time only offer, and that offer will NEVER be offered again. It looks like they could use the business. While, we didn’t care for the décor in this Hilton suite, we realize that décor differs by property and location. No doubt, it would be nice to have the amenities offered in the Hilton timeshare. However, Hilton timeshare amenities resemble everyday life, and where is the vacation in that? 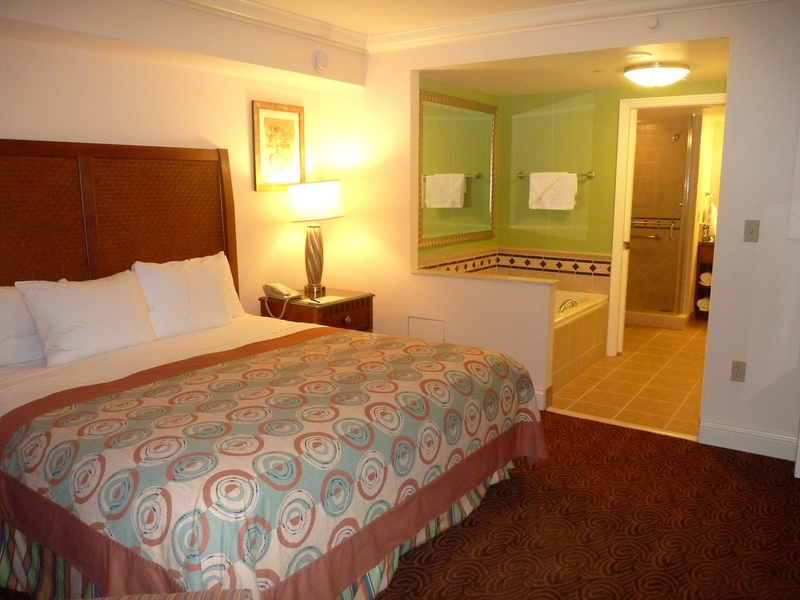 We realize that we don’t have to use the amenities offered in the timeshare suites, but we have already paid for them. So, where is the bargain? Mostly, why all the high pressure tactics, the threats of NEVER being offered a good deal again. To anyone reading this, in our opinion, any time something is being sold as never again being offered, ask yourself why. Under normal circumstances, salesmen want to sell, and if you have the money or the credit they will sell to you. Under normal circumstances the goal of all salesmen is to sell. Additionally, we were given in exchange for our time $15.00 in Hilton Casino Chips, not for use in slot machines. We should mention Hilton Casino in Las Vegas is a pretty tired looking. It actually looks like they haven’t updated it since it was built. It is the kind of place my grandmother would have liked 20 years ago. We always wondered why the Hilton girls, Paris and Nicki, stayed at the Palms, now we know. Further, we were given a $50.00 voucher that could be used in the steakhouse house restaurant in the Hilton Casino. We checked the menu before we went in, most things cost about $40.00. The gift wasn’t worth 4 hours of vacation time, so don’t fall for it. This entry was posted in Children Travel, Kid travel, las vegas, las vegas vacation with children, luckylittletravelers, nv. for children, Uncategorized and tagged Hilton Grand Vacation Club Timeshares, Hilton Grand Vacation Club Timeshares Las Vegas, nevada, timeshares las vegas. Bookmark the permalink.